Here it is folks! The long awaited update to my Zelda adventure map! More than just an update, it's no longer inspired by Zelda, it IS a stand alone Zelda adventure map! Play as Link and fight your way through nine dungeons. Bring peace back to the land of Hyrule and save the princess Zelda! Create a new character and throw away your starting items when you enter the adventure map. You can only buy ammo, potions and throwable items like shurikens from the vendors. Player 1 should always grab the chest from the bottom center when 4 chests are in a triangle. If there are two or more signs next to each other, always read left to right. Golden Tombstones are used as signs. Items dropped from bosses can be used. If rope drops, please don't use them, as they can be used to break progression. Do not take the clothes off mannequins. Collect Fallen Stars to make Mana Crystals to gain more mana. No breaking blocks, except in Gannondorf's Lair with the explosives given, but you will need to place blocks to proceed after defeating the Eye of Cthulhu. Up to 4 players can coop through the adventure! The rules are the same as the single player rules. To install the world, simply drag and drop (or copy and paste) the 'A Link to Terraria 3.0.wld' file inside the zip into "C:\Users\*YOURUSERNAME*\Documents\My Games\Terraria\Worlds". Launch the game and look for 'A Link to Terraria'. 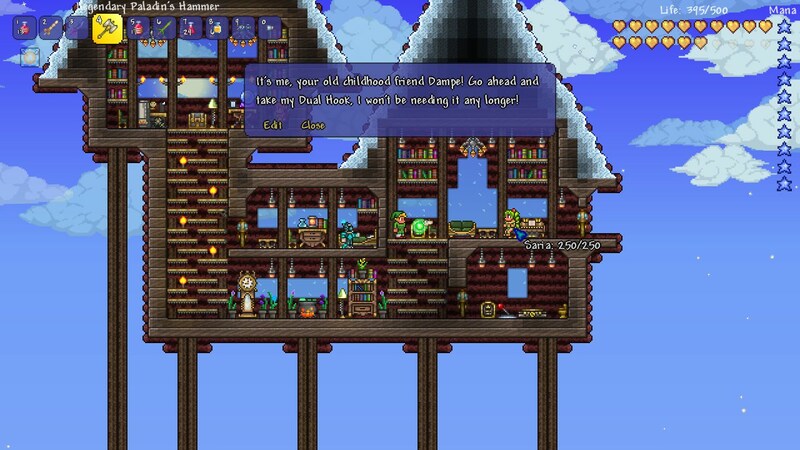 4.0 - 04/07/19 - A Link to Terraria 4.0 has been released! Version 4.0 contains new mechanics, new secrets and a fresh coat of paint across the entire adventure. A fresh coat of paint. Three quarters of the map has seen a visual update with different materials, paint and more sloped blocks added. The Seven Medallions(Souls of Might) have been replaced with The Sacred Jewels(Large Gems). New secrets are opened up by using the various Large Gems. Because the large gems drop when killed, various piggy banks have been placed around Hyrule to safely store your Large Gems. The starting dungeon has been updated with new mechanics. The Seven Sages each have their own unique style of robes and hats. Mundus Village has been redesigned and the Mayor's Vault now contains even more loot. Hyrule Castle has been expanded. Introducing the Wizard's Tower, Library, and drawbridge with the Royal Forge getting an upgrade. The Town Well has been revamped with new mechanics. The Sky Temple has a new beginning section. The Earth Temple has a new entrance, making the trek in and out much faster. The Elder's Temple has a new Test of Wisdom, replacing the boring maze section. Ganondorf's Ship has landed on the map, shattering the Glass Maze it replaced into sand. Ganondorf's Ship is anchored in the new desert, just east of the mountain. King Slime has a new arena. The Water Temple also has a new entrance and a new beginning section was added. Thanks to Vessyl for pointing out how easy it was to sequence break the Water Temple. A large part of the Underground Jungle has been taken over with an Underground Mushroom biome lighting the way for you and giving you a reprieve from jungle enemies. The Fire Temple has various improvements and balancing tweaks, making some sections harder. Ganondorf's Lair has a new entrance. The section to get the Temple Key has been reworked. More secrets including more magic weapons for all the mages out there. Added a secret quest to use biome keys that starts in the Wizard's Tower. Much like a classic Zelda trading quest, search Hyrule Castle between dungeons for biome keys that will unlock a friend in Ganondorf's Lair. Star World 2 is now replayable thanks to a tip from TheWorfer27. Thanks man! Thanks to Terrarian Legends for helping me troubleshoot falling trees in Mundus Village! Thanks to the folks to helped beta test version 4.0, your feedback is incredibly helpful. A HUGE thanks to TheWorfer27, Terrarian Legends, Vessyl & Izzy! 4.0.1 - Fixed a typo on a sign in the Elder's Temple referencing the wrong sword. Thanks to booklover666 for pointing it out! Every dungeon has been reworked to some degree. From the Earth Temple's complete overhaul to the opening dungeons new mechanics. All mazes have been completely changed in all dungeons. Plus, new maze puzzles included! New mini-dungeon post Eater of Worlds. Exciting new escape area, no longer will you be relying on Gravity Potions! Fixed King Slime not properly spawning in his designated area! Even more complex wiring mechanics! More secrets thanks to teleporters! Some dungeons were completely revamped, while all the dungeons got a nice facelift with colored glass, paintings and other random useless background stuff! Plus, there's even more bosses! Fight minibosses like the King Slime and the Queen Bee! And I've also thrown in the Brain of Cthulhu! Have a suggestion? Think you found a bug? Join the discussion on the forums here! Special thanks to all the beta testers! The next update should be out sometime this fall. yw for pointing it out, if i see anything more i will point it out to ya to fix in the next update. but all in all great map it was a fun play. this map is awesome. well done you. i really enjoyed it like i was playing a whole new game with the dynamics that i love! Am I allowed to take money from the tax collector? Also the barrels with arrows, I'm almost positive I only take one stack, but I just want to be sure, also can I use stuff from the Eye of Cthulu to make equipment? I see no harm in taking money from the Tax Collector if you are buying the allowed items. And yes, all items from the barrels are fair game. How would you create it? I don't believe there are any anvils on the map and there's no ore/bars to get to make an anvil. So, no, I don't believe you can make shadow armor. I didn't realize that. Regardless, just use the gear that's given to you and you'll see it's more than fair. 3. 4 chests, do i take all? 1. Sorry! Maybe I should put the weapons to pick up first, before the signs. 3. No, that's in the rules, which are stated at the beginning of the map and on this page. 4. No crafting, which is also in the rules that apparently you didn't read. 2. can i use stars for jester arrows rather than mana crystals? and craft poison darts?